THPBlog: Jackson State Forest planning THP on steep and unstable slopes near Chamberlain Creek Conservation Camp. Jackson State Forest planning THP on steep and unstable slopes near Chamberlain Creek Conservation Camp. This THP is about 14 miles SE of Fort Bragg, CA and close to Highway 20 at an elevation of 400 to 1,200 feet elevation. 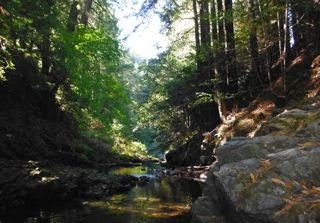 Jackson State Forest is planning a tractor and cable logging operation on steep and unstable slopes in Redwood, Douglas fir, grand fir and western hemlock forests. There are 4 road failure sites including road prism cracking and slipping due to steep slopes, stream and cut bank related erosion, and a road bed failure related to a debris slide. Ground based equipment is proposed for use on slopes over 50% with a high erosion hazard rating, and a skid road and landing are proposed for use adjacent to a debris slide. They also want to use ground based equipment in units designated for cable logging to long line trees, and to use a short segment of road and landing inside a class II watercourse. 3.1 miles of new seasonal road is proposed for construction, and there are 35 road drainage sites planned for work including rocking, dip construction, ditch cleaning, culvert repair/replacement and road bed stabilization. The Camp 20 Marbled murrelet grove is located within .25 mi of THP area, and glory brush was found at 4 locations in the THP area. More information is available on the THP Tracking Center website.